I was skeptical of Guild Wars 2. 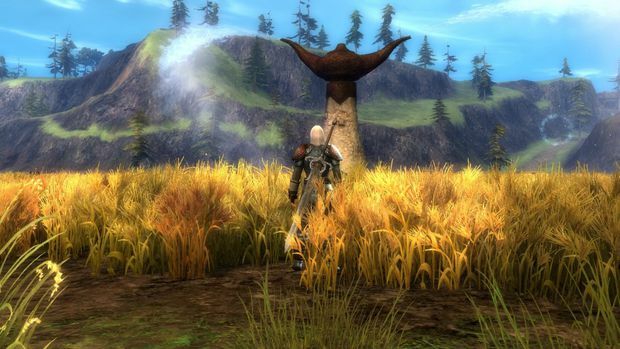 The original Guild Wars, by ArenaNet's own admission, was a Cooperative RPG (CORPG), and not an MMO. As a result, the game was heavily instanced, and even though it was a decent dungeon crawler, I felt like it didn't really do anything that hadn't been done before, ultimately leaving me to stick to Diablo II and Phantasy Star Online. 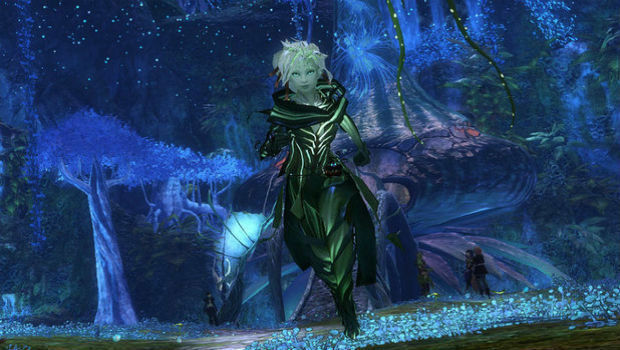 Some time into the development of Guild Wars 2, I started to hear more promising things. A true non-instanced open world. Dynamic questing. More playable races outside of humans. It's things like these that forced me to take notice of ArenaNet's latest foray into the RPG realm, and the decision of whether or not to stick with it wouldn't be easy, given my thoughts on the original. After sinking over a hundred hours into the beta, and about that much time in the final release, I've come to a decision. Since our own Jonathan Ross already nailed down the basic mechanics of the game in this awesome guide, I'm going to stick to my own personal impressions as much as possible here, and not elongate too much on basic information. There are a few things you do need to remember, though. First off, this isn't your typical MMO. There are no dedicated healers and damage soakers (tanks). Each class can do everything, and every race can be every class. It's a seemingly small yet genius design decision that lets me play the game the exact way I want to play it. Typical restrictions are gone in both party composition and questing mechanics. You can visit anywhere you've previously explored at any point, and since the game scales your level down if you're in a lower area, you can even quest in low-level zones and still get the same amount of experience. I can't stress enough how much more fun MMOs are without those prior restrictions that have been in place for nearly decades. Being able to warp to any point on the map at anytime outside of combat is ingenious. It doesn't punish the player for wanting to explore additional areas, and circumvents the mount problem (where players will get mounts and simply rush through content from quest to quest). You simply go wherever you want to, at all times. You'll want to travel as much as possible as well, given the sheer amount of dynamic quests in the game. When I say "dynamic," I really mean dynamic. For example, one quest has a group of centaurs warring with a local human keep. If you push the centaurs back to their own camp, you can quell the rebellion for some time, and the map will reflect that. If you let them push, the keep will feel the attack, and the quest will change for subsequent visitors. Although it works very well at launch, I'm fairly skeptical that ArenaNet will be able to keep this magic up in the future, given how many high-level players will naturally gravitate towards more higher-end areas. 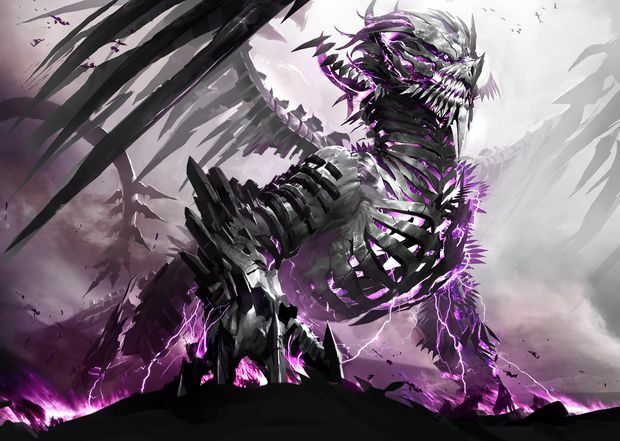 However, ArenaNet has gone on record saying that they will take note of quests that need changing, and will provide hotfixes for problematic areas. These quests also aren't the only way to get your kicks: world events will be happening all the time. Numerous times throughout my travels (more than I can count), events just started happening around me. Sometimes I was the first person on location, fending off countless waves of enemies attacking a farm or fortification, only to be joined by a mass amount of players at the last minute. It's this entropic feeling that anything can happen that permeates nearly all of Guild Wars 2, and a sign that the development team succeeded with a true dynamic quest system. It's basically like Rift's Rift world event system, but better. For more than a few instances during my initial time with the game, I was running thin on quests to do in my starting zone to get to level fifteen in preparation for the next area. I was thinking "Aw nuts, I have to grind," like I had been doing in nearly every single other MMO since Ultima Online. It wasn't until eight hours into my session that I remembered, "Oh yeah! 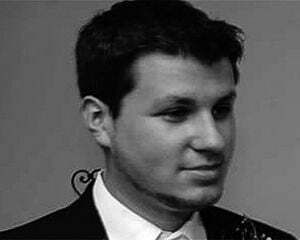 I can just go back and do all four other starting areas in the game, and get comparable experience." Since the game levels you down (scales) accordingly, you're able to go into nearly any area in the game and have at it. Although there is a limit on upwards level progression (for instance, you won't do well in a 15-30 zone as a level eight), the scaling system is brilliant, and best of all, it actually works. You're basically free to go wherever you want -- if you hate a certain area, no problem, just warp over from Lion's Arch (the capital city for all races) to another one of the five race's individual capital cities and go nuts. Speaking of traveling, Guild Wars 2's style of cartography is the best visualization of a world map that I've ever seen. When you hit "M", the map seamlessly transitions to a beautiful hand-drawn rendition of Tyria, with every single point of interest viewable on it. You can even freely move your character around on the map itself. For the first time in an MMO, I wanted to explore everything. The design team is absolutely brilliant, somehow packing in areas that make sense geographically, but also adding in a ton of easter eggs and secret areas or quests that aren't even marked on the world map. Skill point challenges, area discovery, and vista views will keep you busy for quite some time. Vistas are the main highlight here, as they're essentially elegant platforming puzzles that will test you to your limits. Like classic 3D platforming games of all, pure skill is rewarded here, as some of the city vista challenges are absolutely bonkers. You'll earn XP for just about every single thing in the game except structured PvP -- that includes XP for World versus World, reviving random players you come across during your travels, exploration, crafting, gathering, questing, and so on. Yep, that's right: you can even earn a significant amount of levels through crafting! GW2's fun factor isn't bullet proof, however, as you can experience the same "wear and tear" of RPG questing that you can find in just about any RPG. During one of my multiple eight-hour sessions, I started to get a tad bored of doing quests. The solution? I just jumped into World vs. World, PvP, or started exploring the world at my own pace without combat -- whether it was above or below ground. 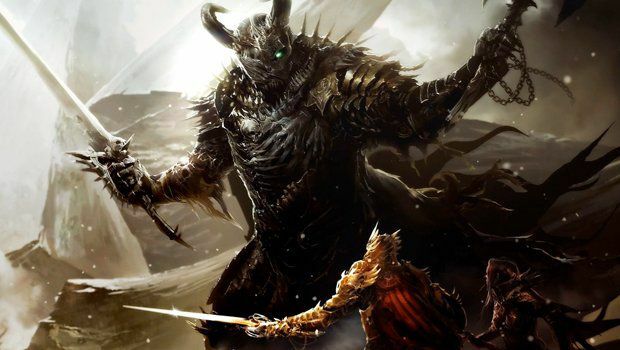 Structured PvP is also wonderfully done in Guild Wars 2, as ArenaNet has catered it towards the eSport crowd, while making it fairly simple to ease into as a casual fan. When you jump into PvP, you'll instantly be scaled up to level 80, and have every single skill at your disposal -- no more arguments like "Well, he had better gear" or "Well, I would PvP if I had better gear." Funnily enough, this design of instantly getting everything also makes it easier to test out different types of skills and weapons for Player-versus-Environment purposes. Battles themselves consist of a conquest mode, where players fight to control certain vantage points (just like Arathi Basin in World of Warcraft). Even though I'm not the biggest MMO PvP fan, I was able to appreciate just how much depth there is here in the PvP system, even outside of combat. Just because you already have all of your skills doesn't mean you can't earn anything: you can still buy cosmetic PvP items with glory points you earn, and even though you don't obtain proper XP, PvP has its own level ranking. ArenaNet will also be hosting tournaments from time to time, with buy-ins. Right now, Conquest is the only game mode available, but the team has said that other modes will be considered for the future. For those of you who are looking for a more relaxed PVP experience, WvW (World versus World) is your best bet. 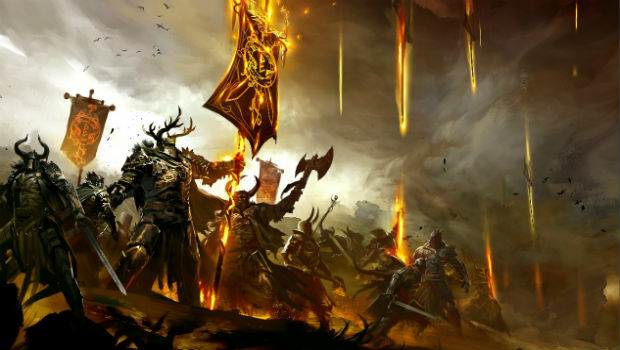 WvW is a game mode that basically puts you in the middle of a giant RTS battle featuring hundreds of real-life players, similar to a massive player-based Dynasty Warriors map. There's siege weapons, extra WvW-specific items, and special objectives that give it a different feel from the rest of the game. Heck, there are even jumping puzzles in WvW. The best part of all this is that you earn XP for your efforts, and there are a number of dynamic quests and NPCs in the WvW battlefield to mess around with. Even if your aim is to roleplay or experience a different PvE experience and you have no interest in actual PvP, you'll have a ton of fun here. In fact, most of my time spent in WvW is probably doing roleplay-type stuff, playing around with other people, doing mini sorties and the like. When I get bored, I can just jump out. But enough about combat and questing -- what about the lore? Well, there are no "horde vs. alliance" or similar implications to worry about here when picking a race -- every race for the purposes of the game, is locked in PvE with the same goals. Of course, that doesn't mean everyone gets along perfectly, as you'll see when enacting your personal story quests. For instance, as a Sylvari, I'm generally fairly partial in my moral choices, but I make it my personal mission to dump on the smug Asura every chance I get. The writers did an excellent job making you care about each race, and regardless of whether you decide to roleplay or not, you'll at least be remotely interesting in just about pretty much every major character story you meet. To drive this point home, a few months ago, I had the chance to sit down with Jeff Grubb, resident lore master of the Guild Wars series. It was clear that he was extremely passionate about his creations, so much that you can easily see his passion in the game without having to look too hard. There are so many details in the game's dialogue, world, and character models, you'll instantly want to become a part of Tyria. In terms of story delivery, Guild Wars 2 strikes a comfortable medium between World of Warcraft's endless quest log reading, and The Old Republic's excessive voice acting for mundane quests. Low-key quests will usually just be sprung on you without having to sit and wait to sift through a meaningless dialogue wheel. You simply enter the area, a quest log notification pops up on the top right of your screen, and you go. Personal quests will offer voice acting (see if you can listen for a few familiar ones), but segments will only be a few minutes total, so they don't wear on you at all. 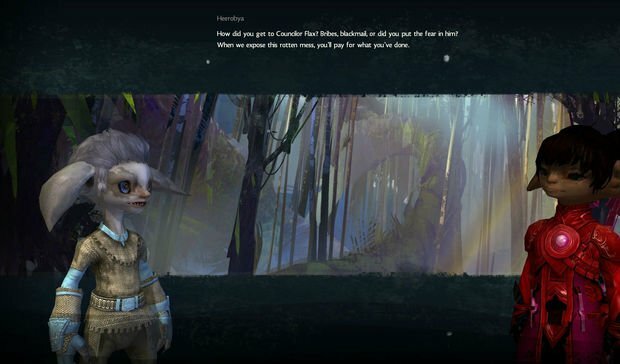 The amazing thing is that although it is kind of lame that your personal story is told through still-models talking on a static screen, said screen is filled with the beautiful concept art by ArenaNet's insanely talented artists. I usually tend to chalk up this type of static storytelling as lazy, but considering this is one of the only ways to see said art in action, that concession is well worth it. All of this can be augmented through the use of the micro-transaction marketplace, dubbed the Black Lion Trading Company in-game. The vast majority of what the Trading Company provides are mostly cosmetic upgrades, but there are also a few extra boosts, such as an XP boost from defeating enemies for an hour. Now, normally an XP boost for cash would bother me, but the stipulations are so stringent that this really can't be abused heavily. Additionally, Guild Wars 2 is a PvE-based game -- you want other people to get ahead, as it benefits you in the end. Ultimately, as long as the microtransaction hub doesn't get too brazen, and it supports the idea of no monthly subscription fee, I'm willing to support it. 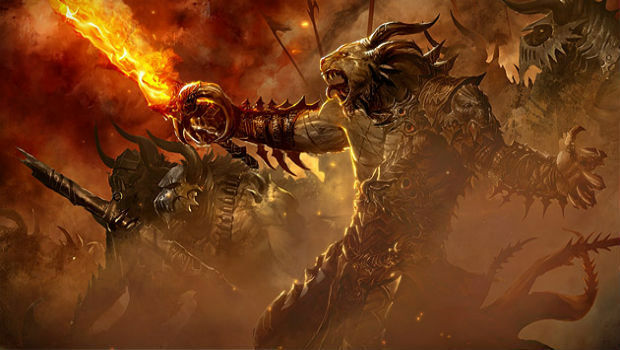 In summation, Guild Wars 2 is an MMO for people who both love and hate MMOs. Outside of living a fulfilling life entirely as a crafter (à la Ultima Online), you can pretty much find solace in anything you can imagine an RPG would provide.